I was checking Alexa for something else and decided to run Wizzley through while I was there. We've got a really lovely review comment! And, in the other news, go Wizzley! Onwards and upwards all. We're doing great! Thanks for checking on us, Jo. Even though you must take Alexa info with a grain of salt, checking with Google Analytics shows a definite upwards curve, too. Yes, we get several thousands visitors a day, currently almost 70% from search engines. Looking good. Absolutely. The site is fast and easy to navigate - I'd have to agree. I normally ignore Google Analytics, because I neither understand nor like it. But I just went in there too. Same story with me! There's been a steady upward line since I set it up. Then a distinct whoosh up over the past couple of weeks. 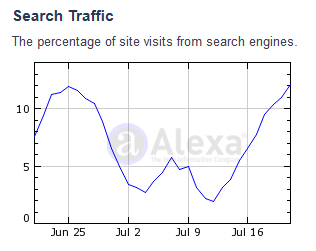 Numbers on Alexa are based on number of visitors with alexa toolbars installed on their browsers. These numbers can be easily manipulated (I have this toolbar and every time I visit wizzley my visit is counted, no matter the same IP). But Alexa can be great for something else: spying on sites out of your control because you can see what keywords drive the most traffic. We should be aware these data is always outdated for at least for couple of months. Another interesting fact: Alexa's owner is Amazon. Some new ideas for somebody?